In my experience, School Board members are rarely reliable commentators on the academic quality of their districts. So an Op-Ed in yesterday’s Denver Post by a sitting Douglas County school board member caught my eye, particularly given the amount of change occurring in the district. I believe pretty strongly that school districts (and their governing bodies) should be primarily judged on the academic outcomes of their students. … and our test scores are higher than four years ago all because we have attracted great teachers, engaged parents and energized students. The Op-Ed left me wondering how exactly DougCo is doing on basic academic measurements over the past few years. So I took a look. My belief is that school districts are best measured by exit-level proficiency (see the introduction to this report for why) where the best single metric is the ACT test which is given to all 11th grade students across Colorado. How has DougCo progressed on their ACT scores over the past few years? Well, results are basically flat from 2008 – 2012; a slight jump in the past two years for a 0.3 increase (1.4%) in total over the last five. 2013 results will be available in August, and maybe we’ll see something substantial, but otherwise it’s hard to put much weight on what is a pretty minor shift. The ACT is only given to 11th graders; let’s look at two other common and more broad measures that are based on the CSAP/TCAP, which is given to all 3rd to 10th graders across the district: the percentage of students who are proficient or advanced, and a measure of academic growth (median growth percentiles). Both, much like ACTs, are essentially flat over the past five years. On balance here it looks like a pretty static district; a little up, a little down, but nothing on which to stake a claim of any kind. Now DougCo’s scores are better than the Colorado average, but they also are a school district with some of the fewest kids in poverty. So to try to see how they are doing relative to other Colorado districts, it makes sense to compare these scores based on the percentage of low-income kids each serves. To do this, I looked at the largest Colorado districts by their average ACT score compared against the percentage of students who were Free and Reduced Lunch (FRL). ACT scores are limited to 11th graders; the FRL status of this test-taking population is not public information, and it seemed somewhat imprecise to measure the FRL of an entire district. Instead, I looked at the same class of kids based on the TCAP they took the year before. So what follows is a graph comparing, for each district, ACT scores (as 11th graders in 2012) compared to an FRL percentage (as 10th graders in 2011). The important concept here is how far each district is from the regression line; those below it are underperforming relative to other districts; those above are doing better than most. And where is DougCo on this graph? Well, they had the second-lowest percentage of low-income 10th graders in 2011 (11%), which means that although their average 2012 ACT is the fifth highest in the sample group, it is below the regression line. 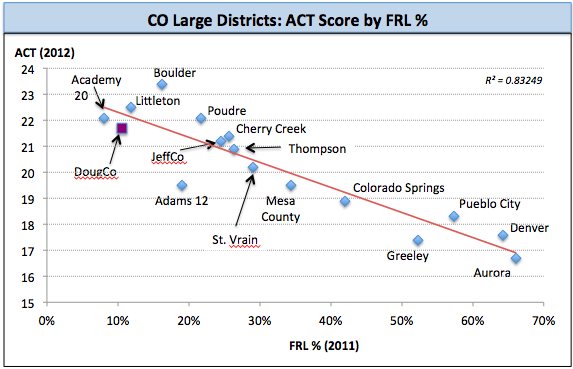 DougCo is slightly under where they should be for ACT scores, given the affluence of the district. Again, the ACT is just for 11th graders; we can look at TCAP scores for 3rd to 10th graders, as well as the specific FRL of those kids. 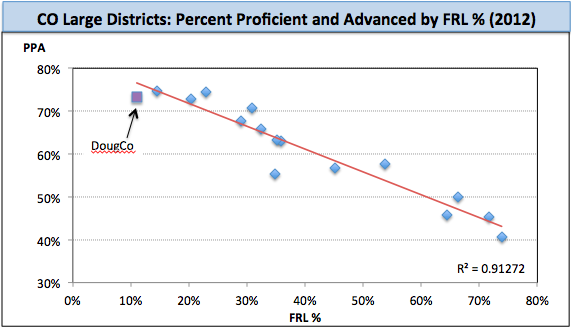 And the pattern is the same for overall proficiency, where DougCo is again slightly below the regression line (I did not add labels for all districts, as there is very little change). For academic growth, where scores are normalized for income, DougCo does slightly better than the State median of 50 (a 2012 score of 52.7). That one goes in the plus column. But overall, the record here is pretty undistinguished and has shifted not much at all. Why does this all matter? For the claim that “our test scores are higher than four years ago” is both vague (which scores?) and precise (why four years instead of five? ), so it is probably technically correct. And it is clearly not the point of the essay, which is more of a polemic against teacher unions than anything else. Well, I’ve written before about DougCo, and I’m not a particular fan of the way the district is addressing its issues. This essay seems like merely another volley in an increasingly ideological fight. I am mixed on many of the policies here, and there are some I support quite strongly. But my lodestar is that policy has to be in service of student achievement. And this is where I diverge from DougCo, who seems to be pursuing an agenda whose primary intention is to further a set of political ideas, and less about improved outcomes for kids. The achievement data above tells me that it’s a good thing DougCo wants to make some changes. And in fairness, it is challenging to improve a large district, regardless of its demographic makeup. But I think it is even harder to do so if there is no clearly articulated goal for academic outcomes, and I have not seen and measurable academic goal set by the DougCo board (which might read something like “we are going to make changes because in five years we want to raise average ACT scores to 23 and increase overall proficiency by 5%”). In the absence of quantified academic goals, DougCo seems content on a power struggle with its union. And the problem is they can win that struggle (or lose it), without any change in the academic trajectory of their students. In the end, if there is no increase in student outcomes, the end result will simply be to trade one ideology for another, and that does not help kids. Achievement first. This entry was posted in District Performance, Student Achievement, Teacher Unions and tagged DougCo. Bookmark the permalink. 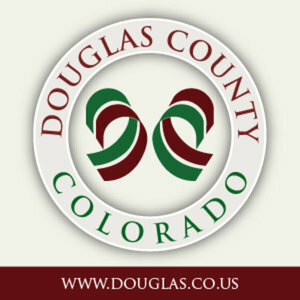 2 Responses to DougCo: Sound and Fury Signifying Something? Certain aspects of the district’s strategic plan — the Choice Scholarship and Pay for Performance — have received by far the most attention. But student choice enhancements are much broader, systems performance upgrades (including evaluations and PD) have been significant, while the focus on world-class academic standards has been almost completely overlooked. Ending the union contract was a means to an end. I agree it’s healthy to filter through the political rhetoric to get to what is most important, but the political context is inescapable with traditional power groups uncomfortable (to say the least) about what new arrangements portend. The first meaningful batch of results to look at for Dougco students will be this year’s TCAP, and even more so the coming year. But other assessment data will be even more helpful in years to come as the district strives to deepen learning. The bottom line here is one that cannot be argued with: every district policy or reform thereof should be in the best interest of the students toward continuous academic improvement, not driven by political/philosophical/partisan intransigence…on either side.